"And we came upon a greate wyde roade of a rod in breadthe and we followed it several dayes and to our greate dysmaye found oursylves backe at the pointe from whence we cayme"
That car window is a movie screen, and you're watching the show as you drive through Virginia. It's a bigger image than IMAX, and the color is much richer than what you see projected on a theater screen. A TV can't come close, of course. We'll provide (ultimately...) a virtual tour here, with an emphasis on natural and historical resources just outside the window. If you're in a car now, browsing the Web with a high-tech device, take advantage of a simple upgrade to access Smell-O-Rama features. Just roll down your window, especially if the honeysuckle is blooming in June. Or - gasp! 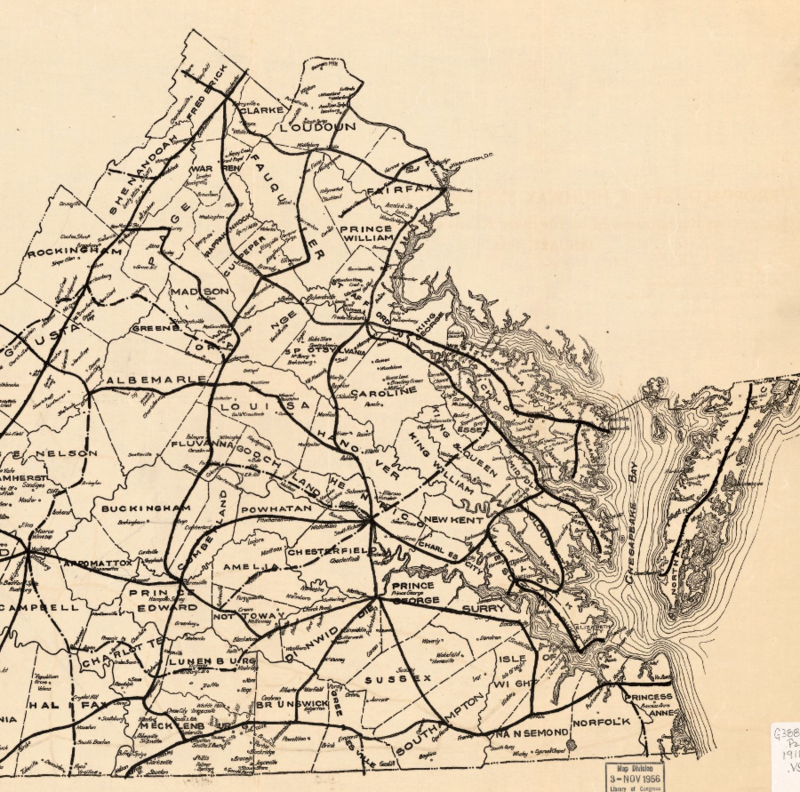 Where do Virginia roads come from? Some started as animal paths, were used as Native American trails, then were upgraded to wagon roads by the European immigrants. Where do you think those Europeans built their first road? 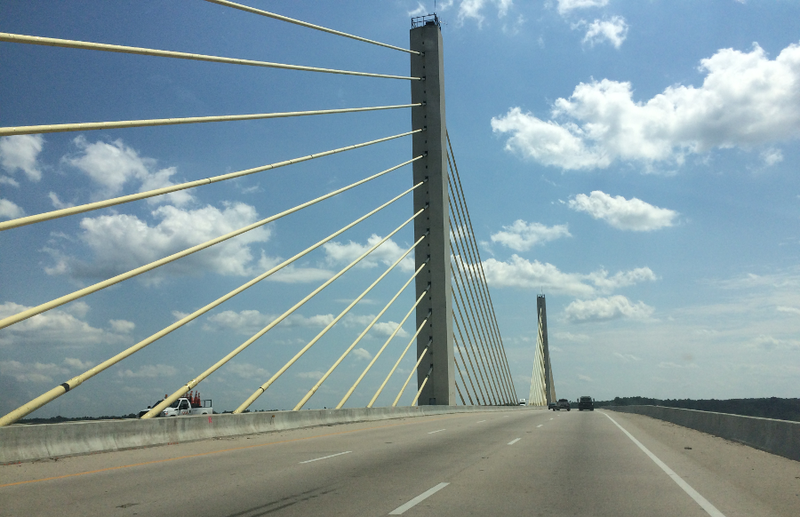 No, it was not I-95 or the Springfield Interchange, though commuters sometimes think they have been under construction since time began. Remember where European settlement started in Virginia, back in 1607. 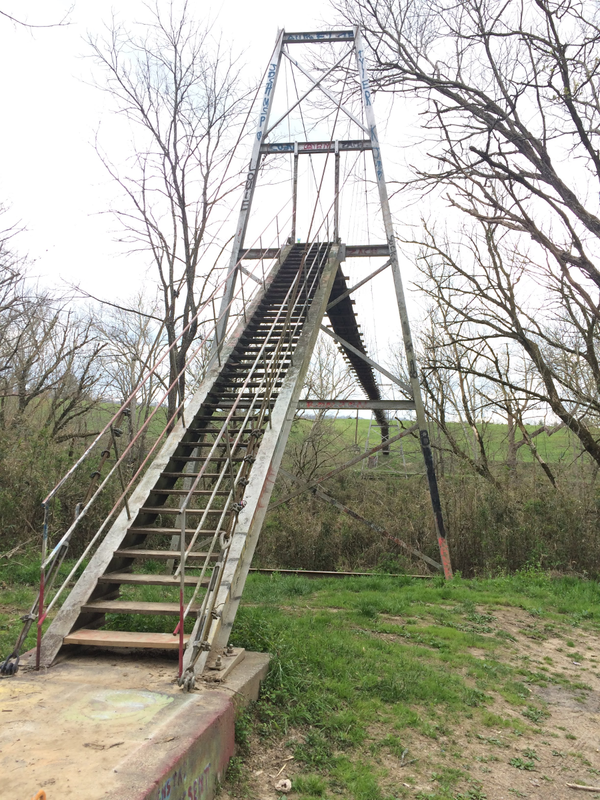 You can still walk on the first road - at Jamestown. The pavement there is oyster shells. On the Coastal Plain, there are few rock "exposures" for development as quarry sites, unlike the basalt at the surface in different locations within the Triassic basins. People walking on the green at Colonial Williamsburg, between the Magazine and the old James City County courthouse, will observe that oyster shells were a common surfacing material in the new capital of the colony. 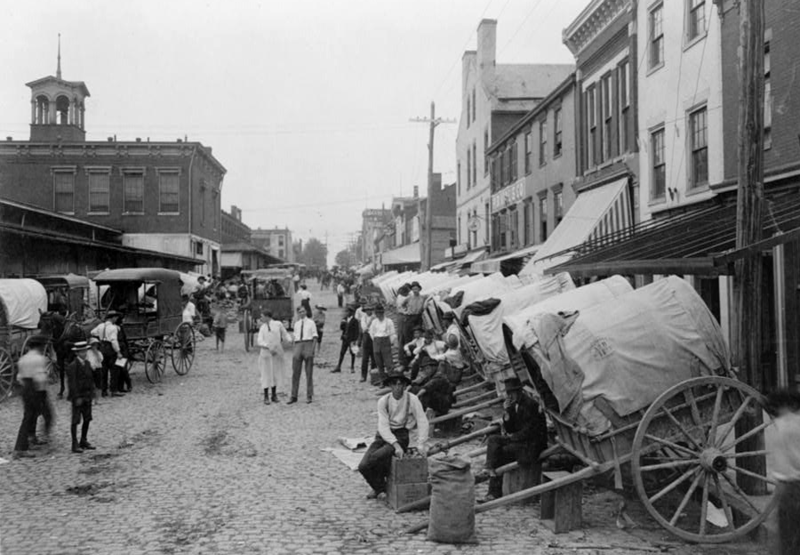 A century after Jamestown was started, the most-common material used for surfacing a road was still oyster shells. 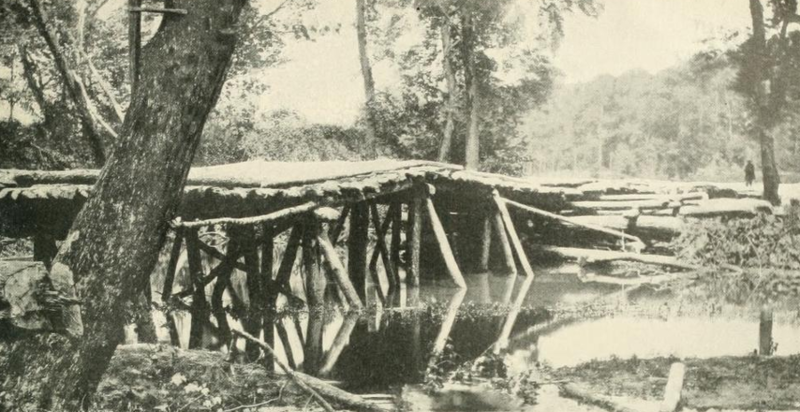 Where timber was readily available, some "plank roads" were built with a wood surface. Some sort of hard surface is necessary for roads built on the Coastal Plain. Rainwater is trapped by lenses of clay within the sediments; the Cretaceous sediments are not just sandy particles that drain quickly. Wagon wheels cut deeply into the soft ground, and muddy roads after rainstorms can quickly become impassible if not surfaced with some sort of hard material. Road quality affected Civil War battles. General George McClellan discovered in the Spring of 1862 that the dirt roads on the Peninsula would not support the pounding by the feet of massed troops. The roads degraded quickly into muddy quagmires, after passage of a few wagons and heavy cannons, slowing his march up the Peninsula. Few large battles were fought in Virginia between November-May, because generals normally waited for the roads to dry out. In January 1863, General Burnside planned a rare winter offensive, trying to convince President Lincoln that he was agressive enough to be retained as commander of the Army of the Potomac despite the disastrous failure a month earlier at Fredericksburg. Physical geography shaped where the first animal paths, and then trails, and then roads were constructed. Physical geography still constrains transportation choices. Gaps through the mountains and narrow spots in rivers affect the cost of constructing/widening roads. Narrow valleys with many curves require low speed limits on two-lane highways in the Appalachian Plateau, in contrast to narrow-but-straight two-lane highways on the Coastal Plain. 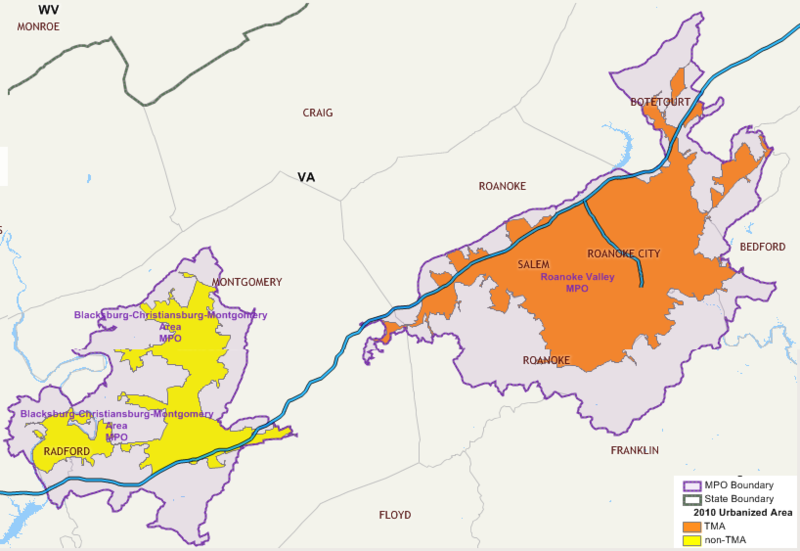 On the Peninsula between Newport News and Richmond, Route 60 follows the watershed divide. 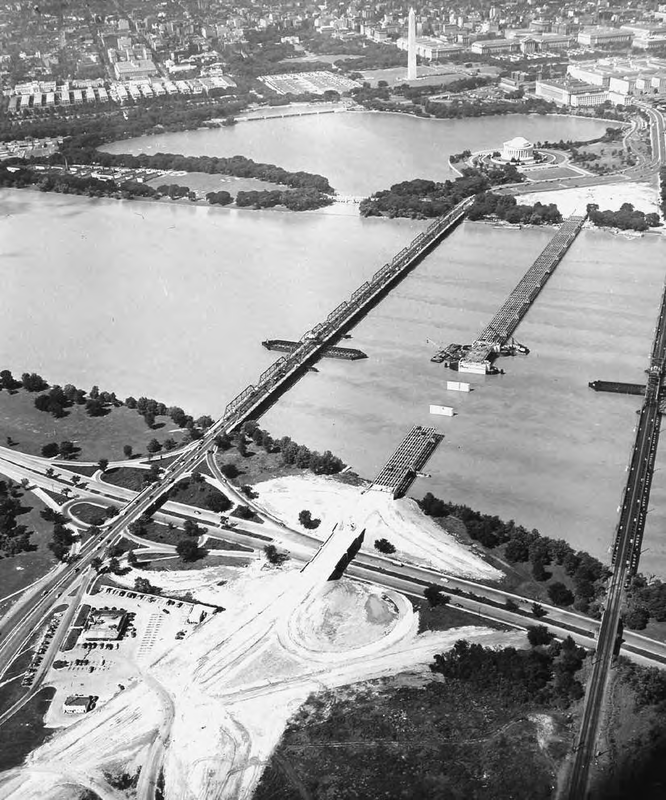 However, with the capacity of transportation engineers to build bridges and use heavy equipment to literally move montains, there has been more flexibility in locating modern roads. 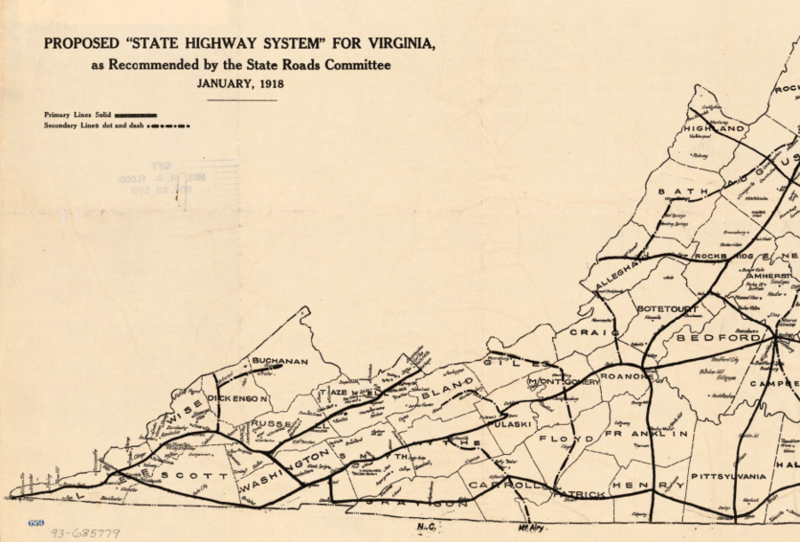 In 1906, the General Assembly created the State Highway Commission. Its members were engineering professors from the University of Virginia, Virginia Military Institute, and the Virginia Agricultural and Mechanical College and Polytechnic Institute (now known as VaTech). In addition, the Highway Commissioner was appointed by the governor. 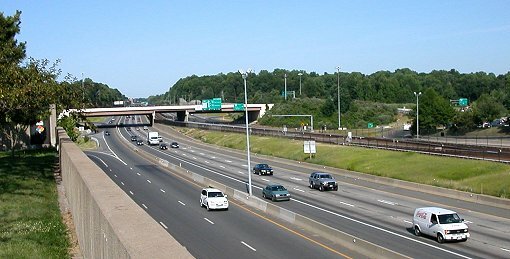 Political geography was been a factor in locating I-85, which directs traffic to Petersburg rather than north through the Piedmont. 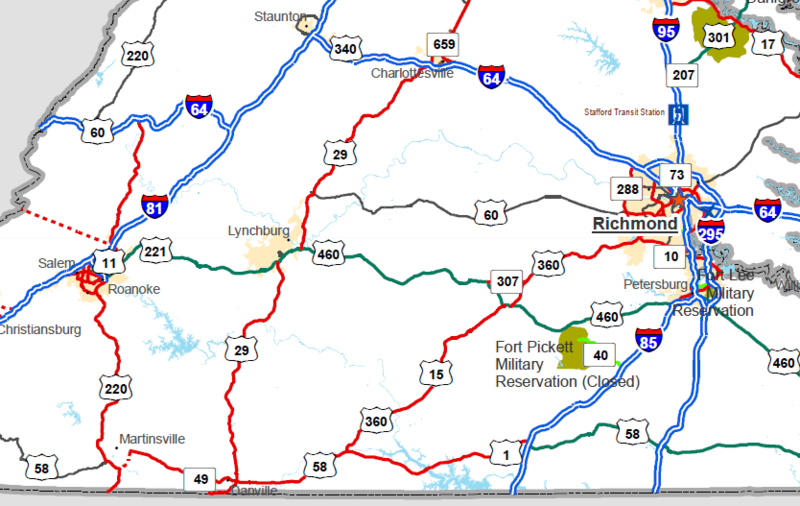 Lynchburg also lost an opportunity to be on I-64, despite the 1959 decision of the state Highway Commission to build the new interstate along the "southern route," the US 460 corridor west from Richmond to Roanoke and then north along the US 220 corridor to Clifton Forge. 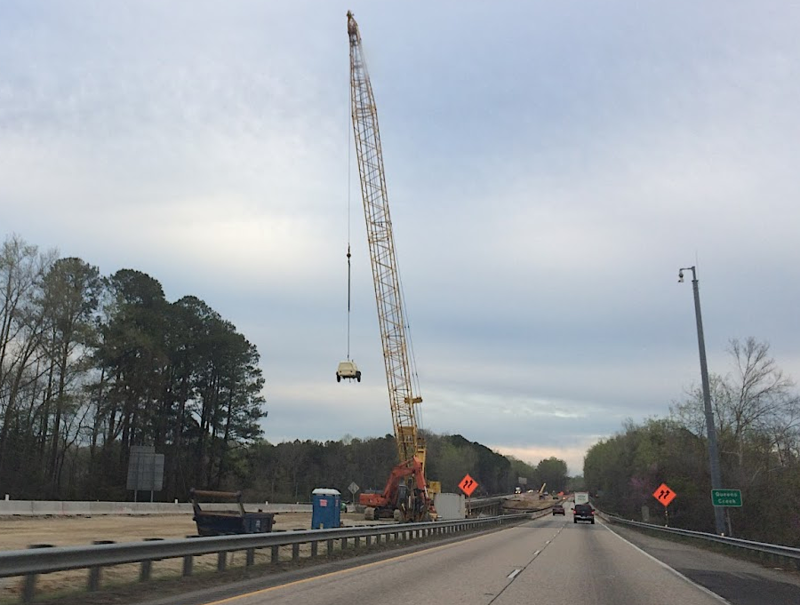 The Federal government, which paid 90% of the construction costs for interstates, overruled the state decision (triggering yet another debate at that time about state's rights). 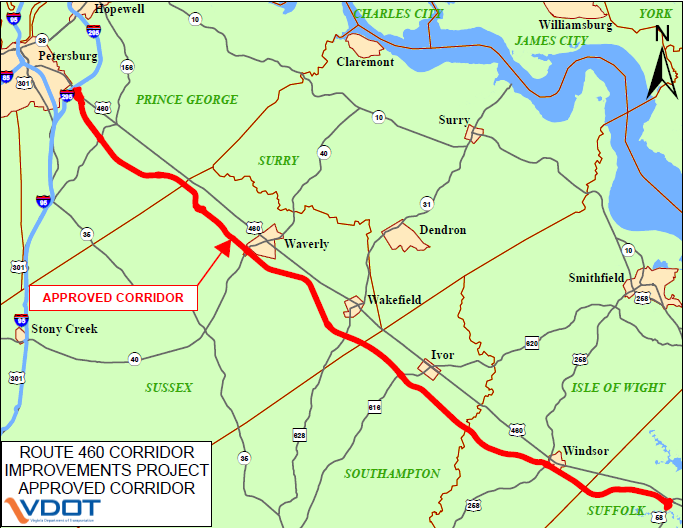 The "northern route" had been recommended by a consulting firm, in part because it was 50 miles shorter and thus cost less to build. 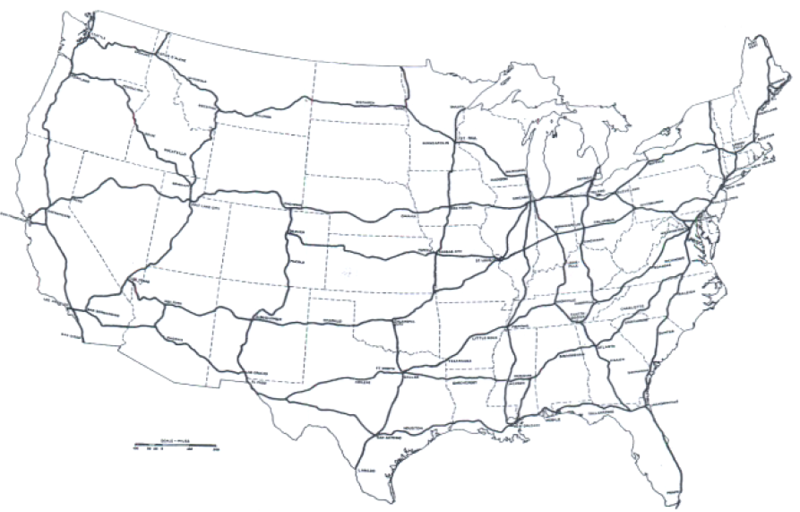 see also Why Does The Interstate System Include Toll Facilities?